These things tend to go in cycles. 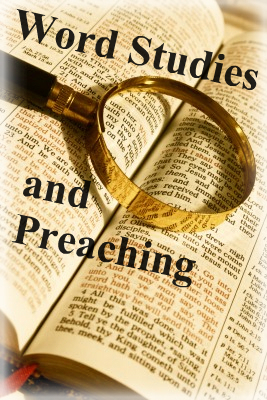 For preachers trained in one era, preaching almost amounted to communicating the fruit of word studies. Some years later and there is almost no evidence of skill in this area. Let’s ponder some issues of methodology and implementation. 1. Word study is only one part of the passage study process, which is only one part of the message preparation process. That means that we shouldn’t see preaching as a sequence of interesting definitions. “…the next word I want you to notice is the word rock in the third verse. The word rock that David uses here means…” This is not really preaching. We need to thoroughly integrate our word study insights into our understanding of the passage as a whole, which then needs to be shaped into a message as a whole. 2. Word study matters because words matter. We need to keep this skill in context, and we also need to keep it in view. That is to say, as a student of the Bible, I need to take every word seriously. In bibliology we may refer to “verbal plenary inspiration of Scripture.” This means that we affirm God’s inspiration of the words (verbal), all of them (plenary). To dismiss word study in favour of discourse analysis is to swing the pendulum too far. To dismiss word study in favour of not studying the passage indicates a deeper issue in our view of God and the Bible. 3. Words hunt in packs. To put that another way, a word on its own is not that helpful. It has been fun to observe my children learning to read (and helping, of course). Once they are set loose into the world of books there is no limit to what they can learn. But suddenly they get past the “Bobby hit the ball to Suzie” stuff and start to meet words they’ve never met before. “Daddy, what does snuff mean?” or “Daddy, what’s a cue?” Like all good parents, my response is to ask a question in response: “Can you tell me the whole sentence?” This context allows me to make sense of that word for them in that place. As we study individual words , we must always remember that we are studying them to make sense of them in a particular sentence, in a particular paragraph, in a particular unit of Scripture. Tomorrow we’ll get into some more specifics on the how-to side of things . . . This site is very informative. It will go a long way in improving my sermon prepration and sermon delivery.